Japanese heavies, 120 alpha on tier 6 lights, 32 per on caernarvon...is that really happening, Ribble? wiggle wiggle wiggle wiggle wiggle yeah! Why don't we have the detection and range finder circle on the minimap. I don't see any reason not to add it other than the minimap is to small. Edited by Vantablack12, 05 April 2019 - 07:46 PM. I cant find anything to put here. Will there be any buffs concerning the AMX AC 48? It is currently an inferior WZ-120-1G FT. It has worse DPM (worst DPM of all tier 8 TDS), huge tumors on top, and the side and rear armor is non-existent. Also, about the WZ-120-1G FT, will there be any upcoming balance changes to it, because it is currently one of the most broken tanks of tier 8. Its a premium tank so I think NOPE! When people cry about being terrible when in reality they are fairly good. Conqueror turret too weak yet the tank is probably the best overall support heavy. Or comparing the Amx AC 48 to the Wz-120-ft. Its like comparing a lion to a baboon. One is a support vehicle that is better at using range to its advantage while the other is an assault tank. You can't substitute one for the other. Its been at least 4 years and these 70 IQ geniuses haven't realized that just because something is classified in a certain does NOT indicate that it should be an neigh impenetrable heavy, a medium that can do everything, a td that should solely camp, or a light that should only spot. Is it so hard to realize that vehicles limit the player, this isn't COD where you can run around doing anything you want. Kek, calling people “70 IQ geniuses”, just proves who you are. Remember the T20 thread? You had the audacity to say it’s “OP” in it’s role. That thing has the worst DPM of all tier 7 mediums, armor is out of question, it’s nothing. It’s mobility can’t even help it. The Conqeuror? Smfh, you do realize other tanks are better at doing that specific job right? And the WZ-120-1G FT. You defending a tank that is downright OP, saying just “COD” it. Just look at the recent stats of it, best damage ratio, best win rate. Look at it’s armor profile, coupled with one of the best in class mobility of all tier 8 TDs, with a gun that can do over 3000 DPM, with good penetration,, but no, according to you, it’s more like “comparing a lion to a baboon”. Are there any plans to buff the M26 Pershing, like maybe a DPM buff? What tank will the new British line start at? Comet or Firefly? Thanks for answering questions here. I see that in update 5.10 the Ram II is getting a serious nerfing. Since this is a premium tank that I paid for with real money, is there going to be any compensation to owners? Also, does this mean that all premiums are nerfable? I thought that wasn’t allowed? Edited by johnnyzim, 14 April 2019 - 01:31 PM. Guys, don't jump on blitzhanger's open test 5.10 changes so fast. These are not necessarily going to be implemented. We'll discuss possible buff for AC 48. Please don't ask me to comment anything posted by unofficial sources. Why many tanks are different in blitz from PC? Just look Luchs, in blitz no 8 shots autoloader, WG is against autoloaders? AMX ELC BIS is stronger in blitz, like a lot of "hp"
Lot of nations in PC, and stickers for your tanks, many stickers. The maps are much smaller, the roles of tanks are much different, and everyone lemming trains. That's why the tanks are balanced differently. my bad, I thought it was official. Simple answer - Blitz is not WoT PC. It was made using WoT base but develops differently. I'm having a really difficult time in finding the logic on how the Smasher was balanced. 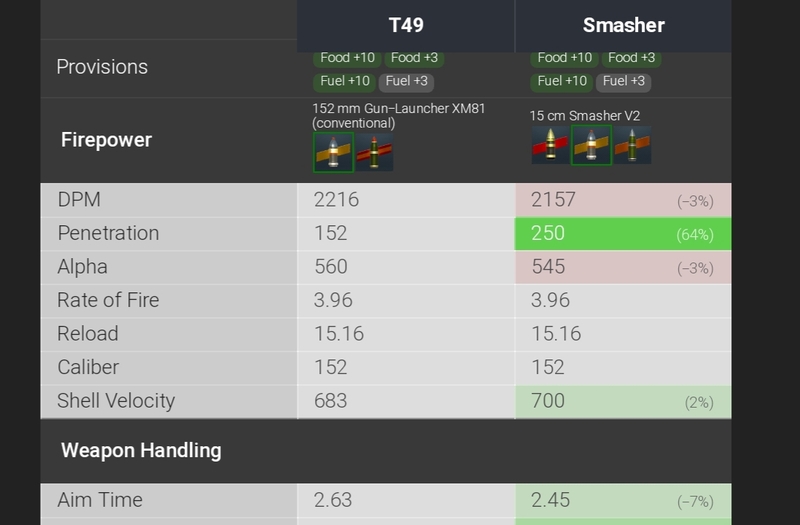 I've ran the numbers between the Smasher and the T49 as well as other same and higher tier tanks. For now I'll focus on the T49. When it comes to gun performance the Smasher comes out ahead in nearly every metric. This simply doesn't seem right. Comparing this data a number of conclusions could be made. 1. 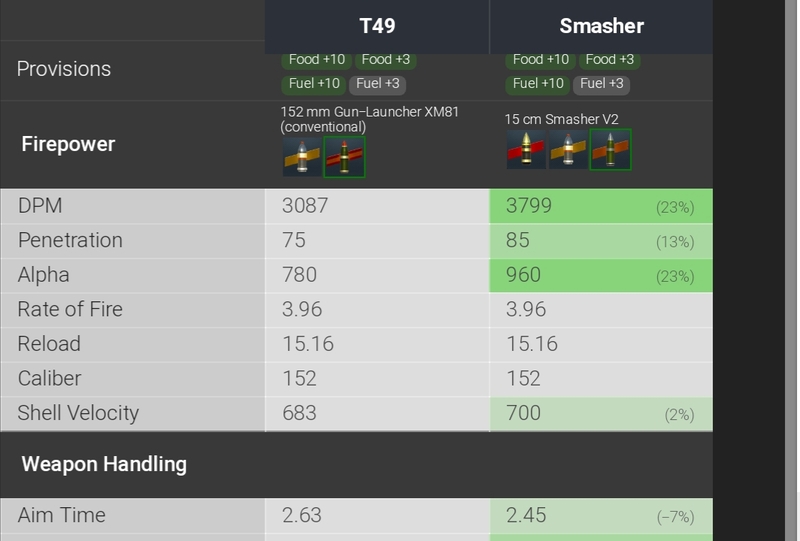 The T49 as well as the KpfPZ are woefully underpowered when compared to the Scavenger. 2. The Scavenger is over powered and either needs a Nerf or to be moved up a tier... or both. It pains me to say this but as it currently stands the Smasher seems blatantly like a pay 2 win tank to me. Does the Blitz team have any plans to address this issue?